The acquisition and development of talent at all levels of high performing organisations is no accident — it’s the result of specific and surprisingly consistent characteristics that can be learned and implemented, found a new study by Bersin. The report titled “Six Key Insights to Put Talent Acquisition at the Center of Business Strategy and Execution”, found that companies with high-maturity talent acquisition functions exhibit 18% higher revenue and 30% greater profitability compared to companies with low-maturity talent acquisition performance. The report noted that talent acquisition and development is an afterthought in many organisations with roles being filled in a reactive “post and pray” manner. By contrast, high performing organisations have effectively placed talent acquisition at the center of their businesses, which can prove to help transform the entire enterprise. Talent acquisition in these organisations has evolved from a routine, regulatory-minded activity to a function of central strategic importance. 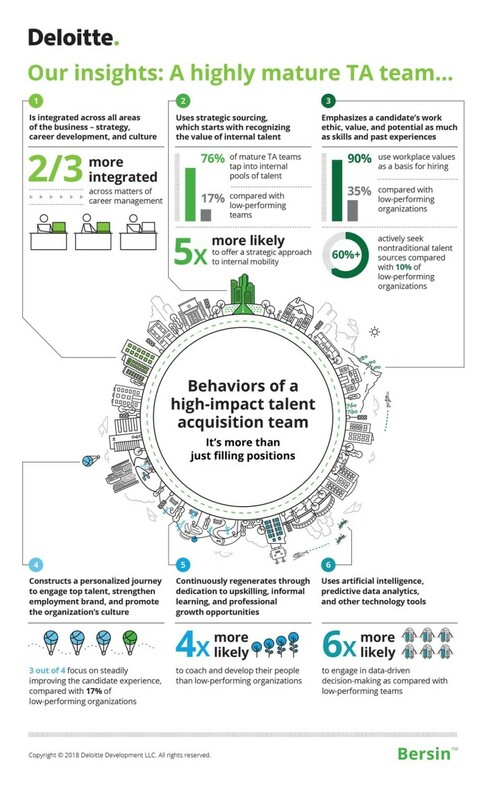 Robin Erickson, vice president and talent acquisition research leader, Bersin, Deloitte Consulting LLP, said: “Talent acquisition, at its highest levels of maturity, can be immensely effective in helping to execute corporate strategy and move a business forward. Stanford research found that Hong Kong job seekers show less enthusiasm at interviews, but how should you look at it?..